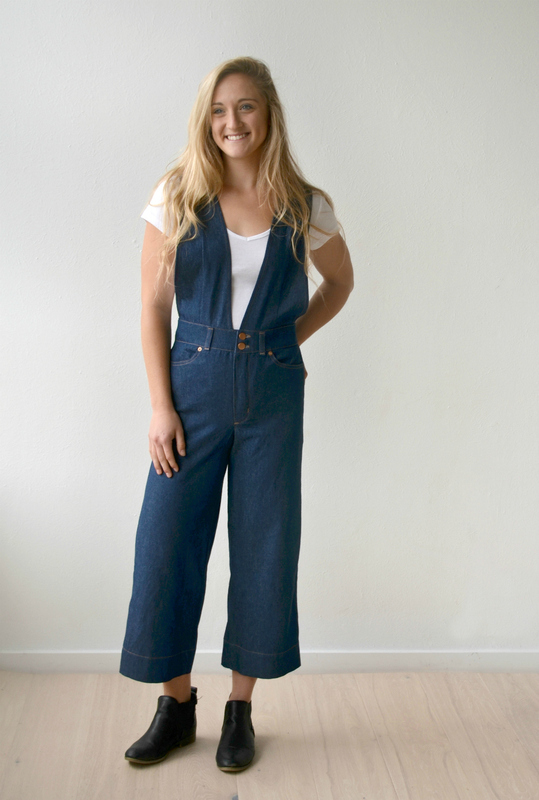 Introducing the Kendrick Overalls! I am SO excited about this pattern! As I was developing it, I saw this style pop up all the time in online boutiques and local shops! 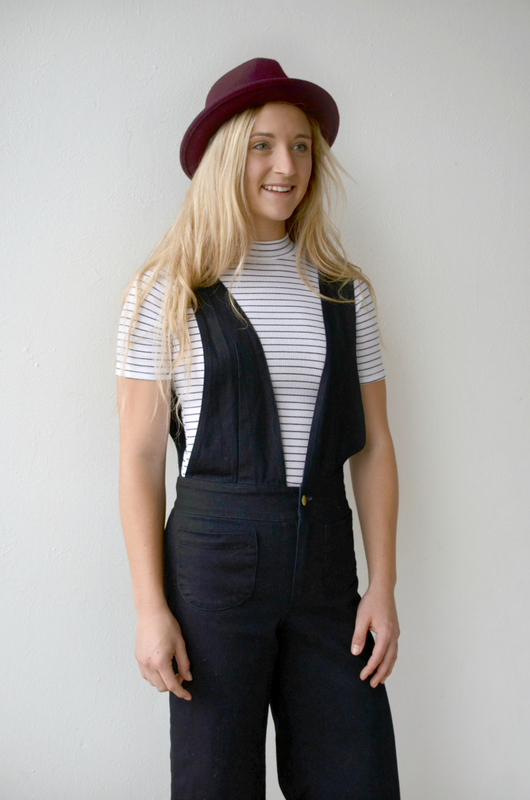 I love that it’s on trend, but also classic and timeless, depending on how you wear it! The Kendrick has two very different views, so I’ll address them one at a time. 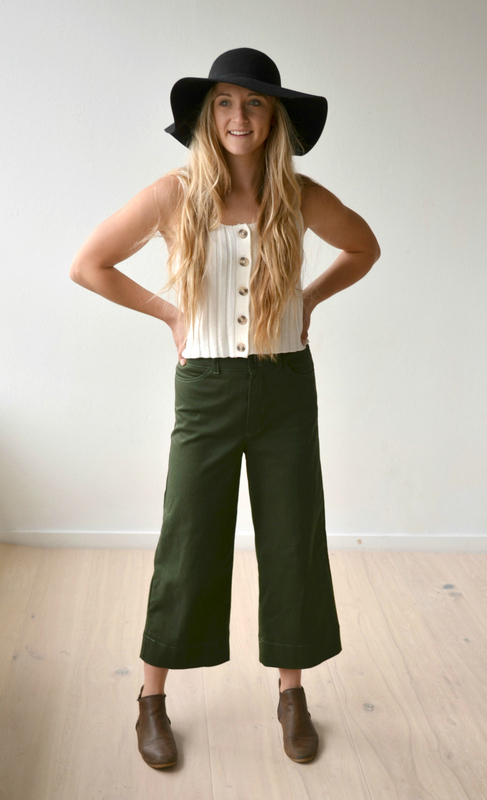 View A is a cropped wide leg pant. The fitted high rise is super flattering on a woman’s shape, then it falls straight down from the hip for a fun and stylish leg silhouette. 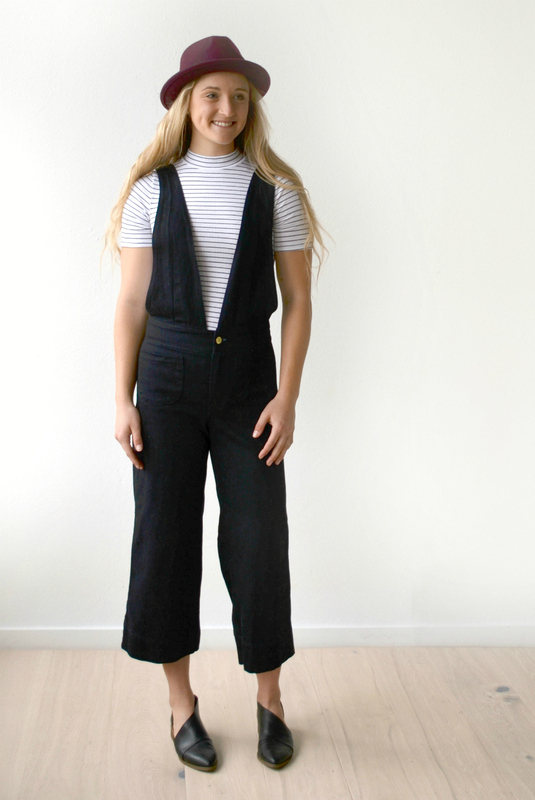 They have an inseam of just over 23″ but can be easily extended to a full length (and spoiler, one of the testers made them as shorts and they were equally cute!) 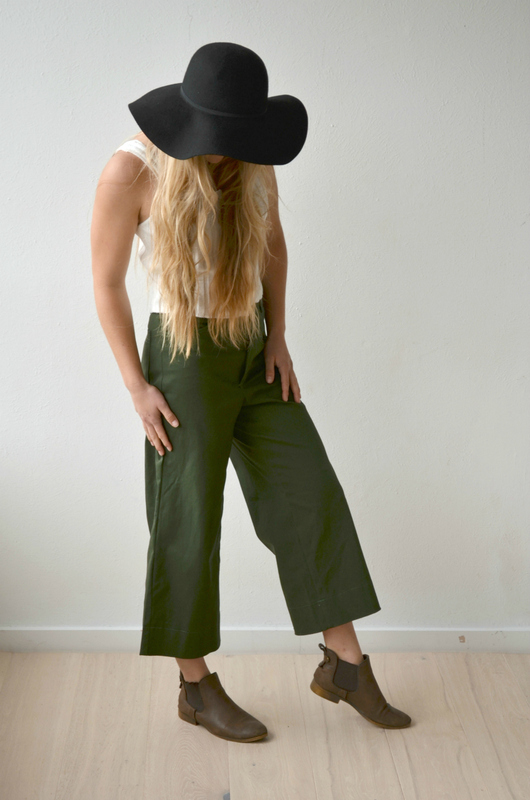 The wider hem balances out the pronounced fitted hip, and the cropped leg shows off a bit of ankle. They look great paired with sandals, sneakers, flats or booties. There are two options for front pockets. 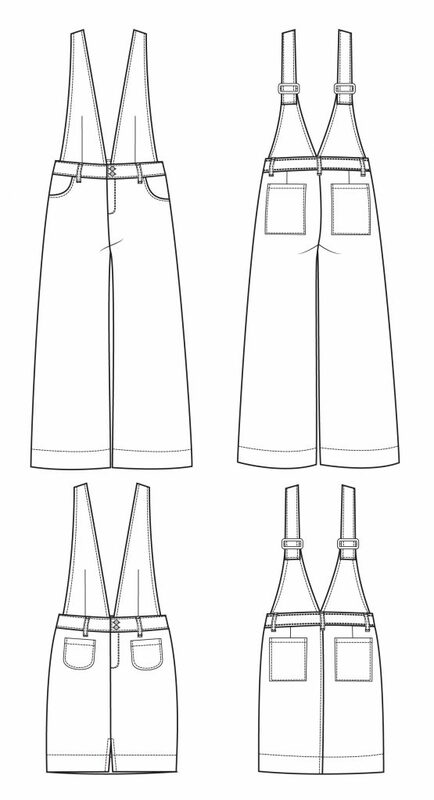 The first is a traditional jeans-style curved hip pockets with a pocket stay to keep the front of the pants nice and flat against the stomach. Also included is a curved patch pocket. 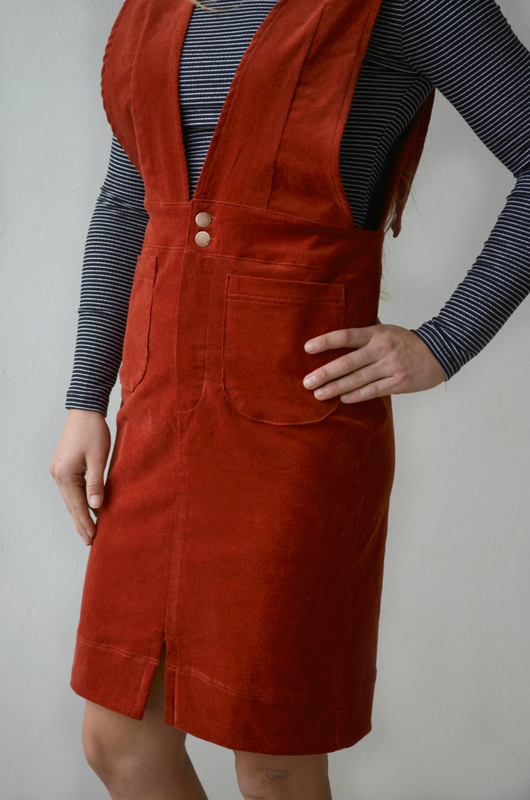 The patch pocket really lends this garment that funky 70s style that is so in right now! There are optional belt loops for more detail and a casual look. 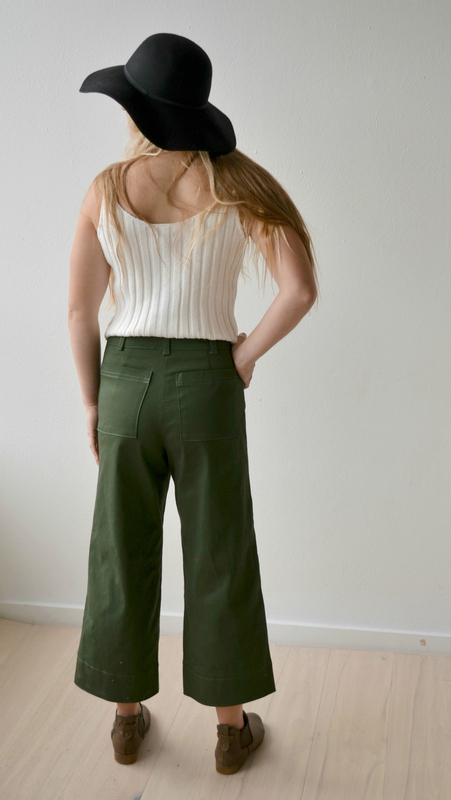 The extra tall waistband is curved to fit the waist better, and while the pattern calls for 2 buttons at the front, the Kendricks can also be made with one larger button. The front closure is a functional zipped fly. 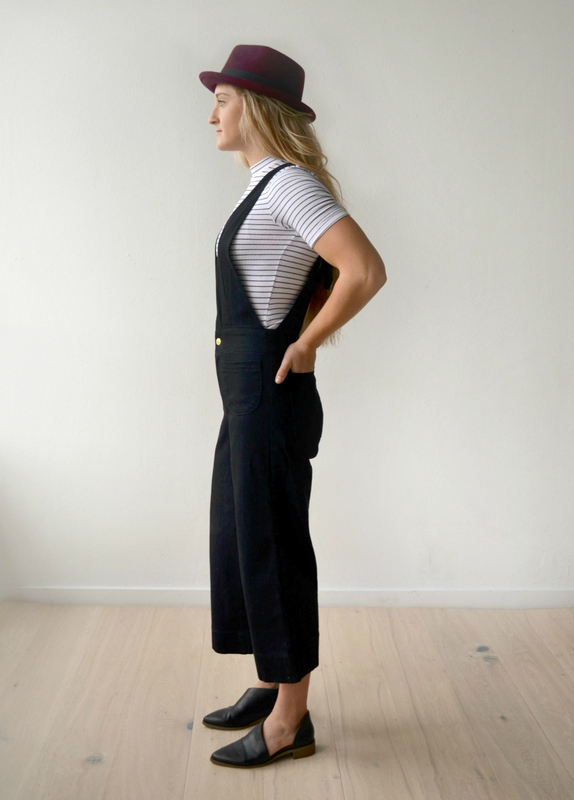 The chunky 3″ hem is a fun detail and gives the hemline some added visual weight too. 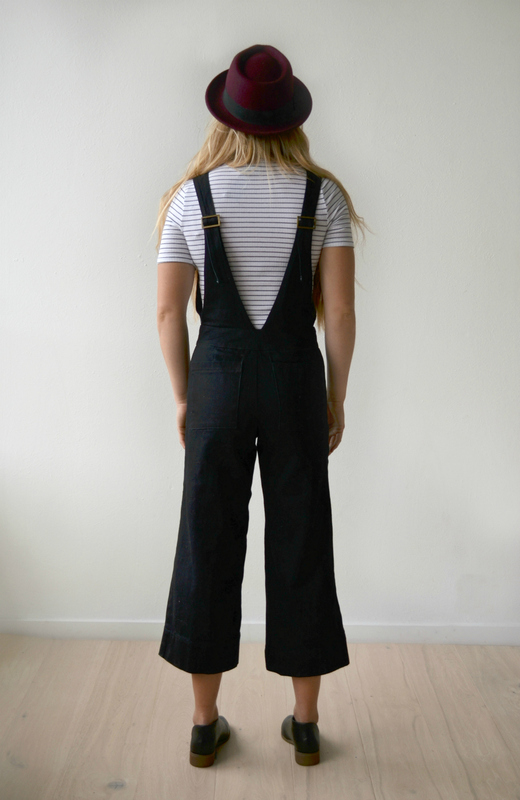 The back has two darts to curve around the backside and make the pants fitted at the waist. A large rectangular patch pocket gives the option for fun stitching and is the perfect size for holding your phone! Depending on fabric you may choose to leave the back pockets off for a fancier look. The overall straps on the Kendrick are more than just a piece of fabric – they were drafted just like a bodice with waist and bust darts. This helps them conform to the body and lie flat against the chest, but it also means they may require some alterations to fit perfectly for everyone. They were drafted for a B sewing cup and a overall height of 5’5″. However, factors such as bust size, bust point height, and waist length will make a big difference in how the straps fit each person. It is important to get the best fit on the straps so they stay up better. The pattern piece includes a shorten/lengthen line and indicates how wide the strap should be as it crosses over the shoulder to achieve the best fit. We went through several iterations of the strap during testing to get the best fit. The pattern piece that we settled on is shown here on the black version, whereas the denim and corduroy versions show a previous iteration. The straps are secured with a single overall slider hardware piece. 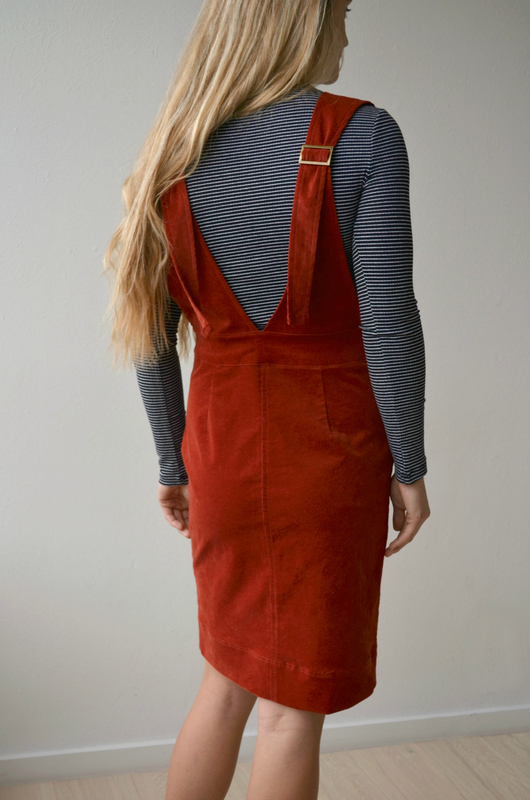 It is sewn to the back strap and then the front strap is threaded through like a belt buckle Because the straps can slide off the shoulders for dressing, you may also choose to secure the straps together permanently with stitching to prevent the front strap from coming loose as you sit and move. The front straps are extra long for a fun detail on the back, but you can also choose to crop and hem them at the length you prefer. Kendrick View B is a fitted pencil-style skirt with extra ease at the hip for sitting and then a narrower hem to really show off those feminine lines. The skirt is meant to hit right at the kneecap for the intended drafted height of 5’5″, however leg length can also be a big factor. 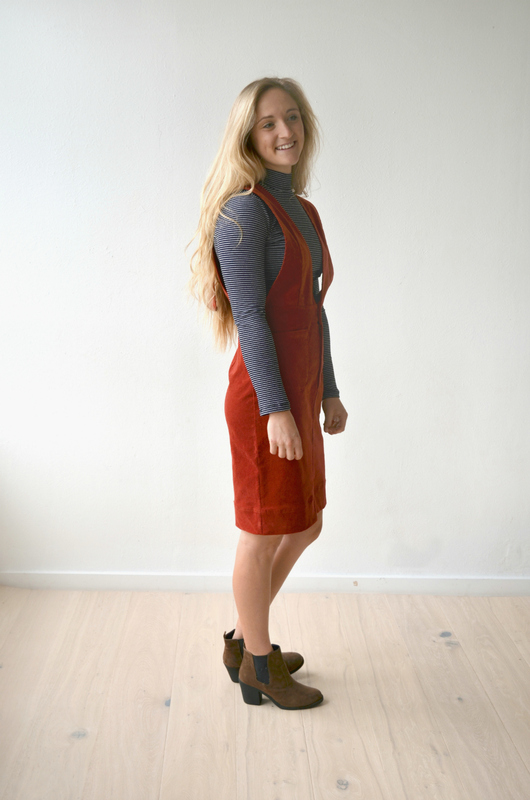 The skirt includes a shorten/lengthen line so you can adjust it to fit you perfectly. 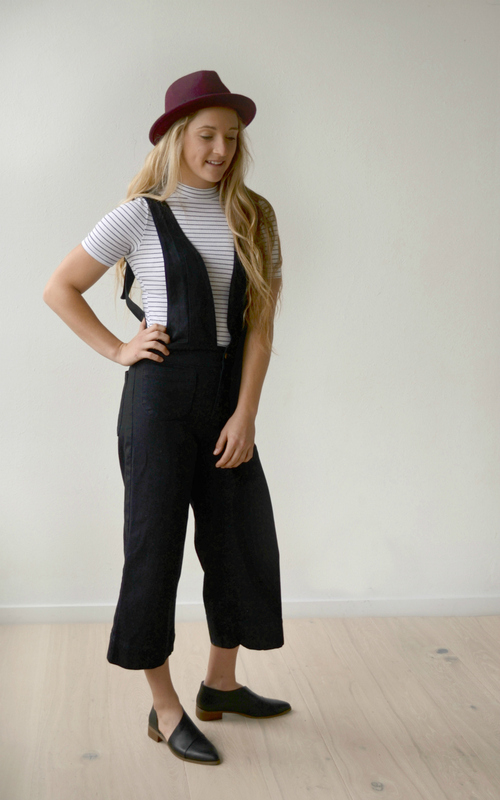 In addition to all of the features outlined in view A, view B also features a chunky hem depth and a cute front slit detail that adds visual interest and provides walking ease. 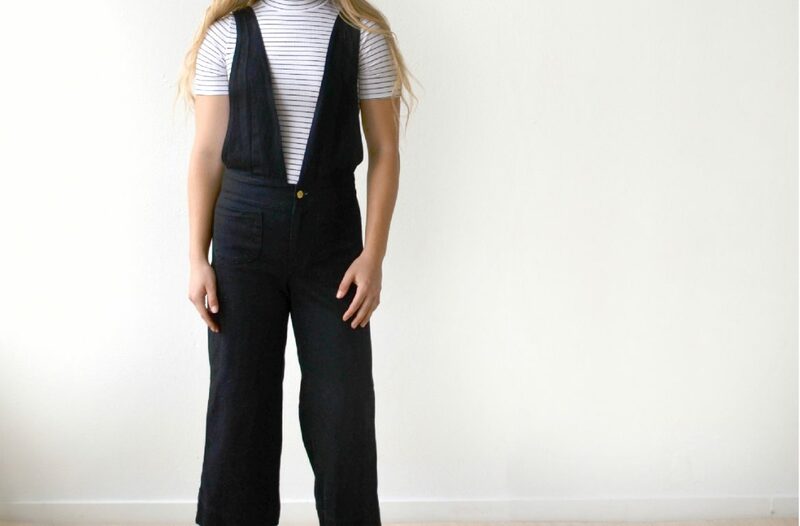 This slit can be made shorter or longer depending on personal preference. 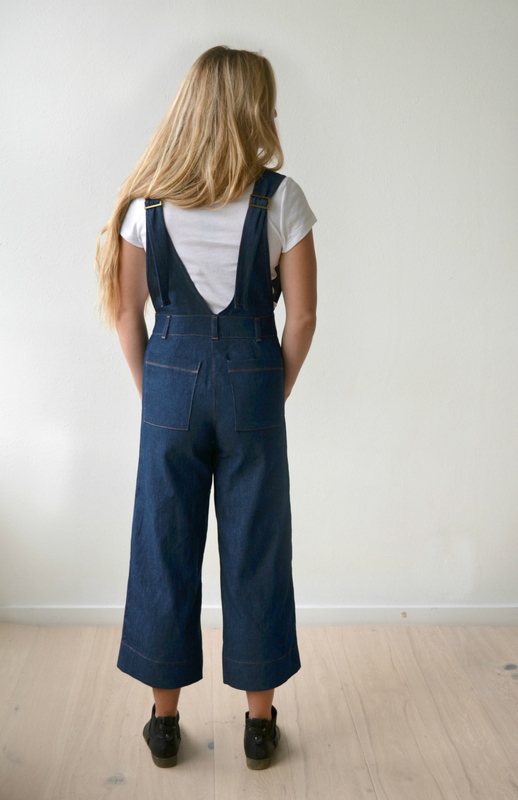 The Kendrick Overalls are designed for non-stretch mid to heavy weight fabric. 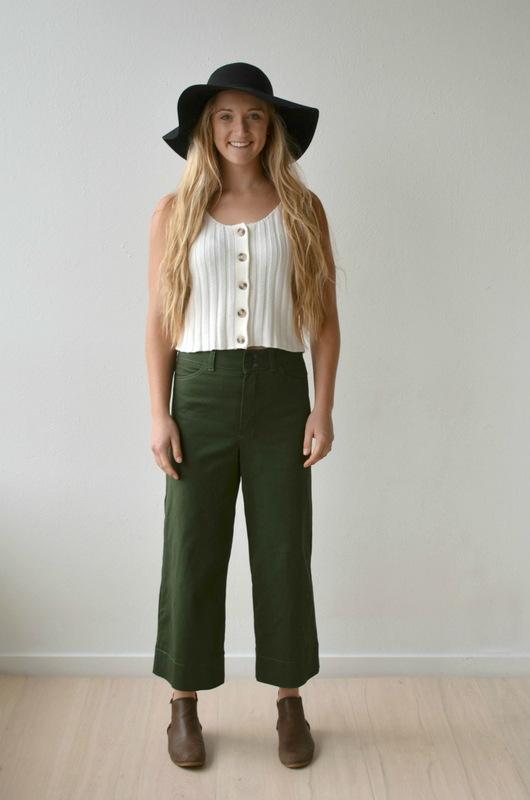 The pants especially work well with a heavier weight denim or similar fabric (10 oz +) and no stretch. The skirt has a small amount of extra ease at the hip, but if you are wearing it to a place where you will be primarily sitting, you may want to give yourself even more ease or make it with more comfortable stretch fabric. If using stretch fabric, you may find that you need to take the pattern pieces in with slightly bigger seam allowances at the back center seam, outseams, and side seams of the waistband. The Kendricks are extremely easy to alter for width because the outseam includes a 1″ seam allowance. In effect, you can grade them up 1 – 2 sizes at the hip without having to grade the pattern pieces at all. 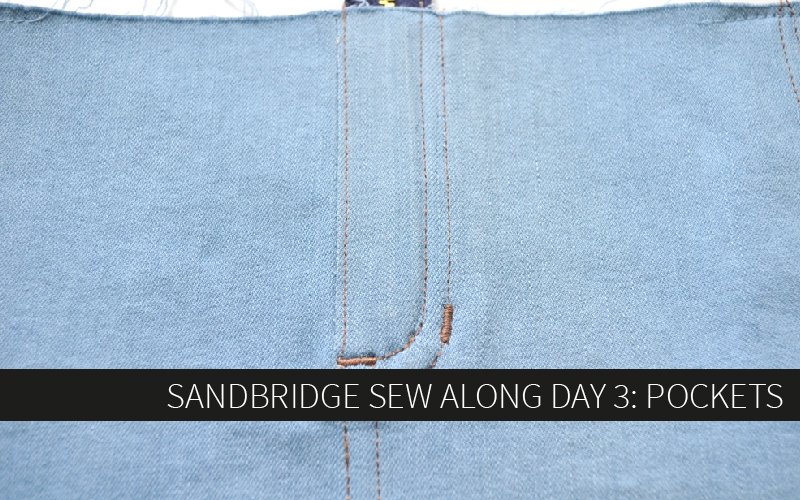 This is also handy for using your previously cut pattern pieces to sew with different fabrics. Heavier non-stretch fabrics can be let out and thinner stretch fabrics can be taken in, all without making any changes to the actual pattern pieces. 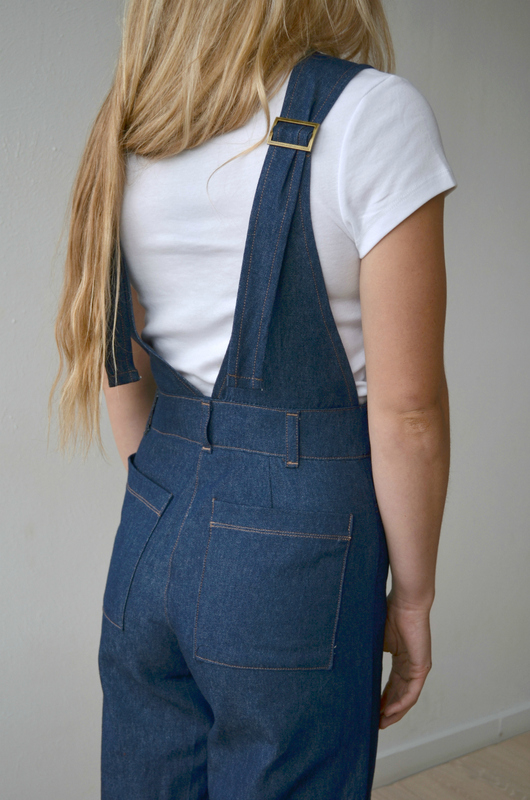 The Kendrick Overalls require 2 sliding hardware pieces, like belt buckles. I got mine from the shop “Lookidd” on Etsy. These are the exact ones I purchased, but the shop has several options. You can also find similar hardware at craft stores, other etsy shops, and other online shops. Be sure to check out the bag making section if you don’t see them with the sewing notions. You can also get the type where the middle bar is adjustable. I got my jeans kits from Blackbird Fabrics and the quality is amazing. They come with 2 jeans buttons, a long zipper, and rivets in several different colors and finishes. I highly recommend buying these kits because they have everything you need for a great price! 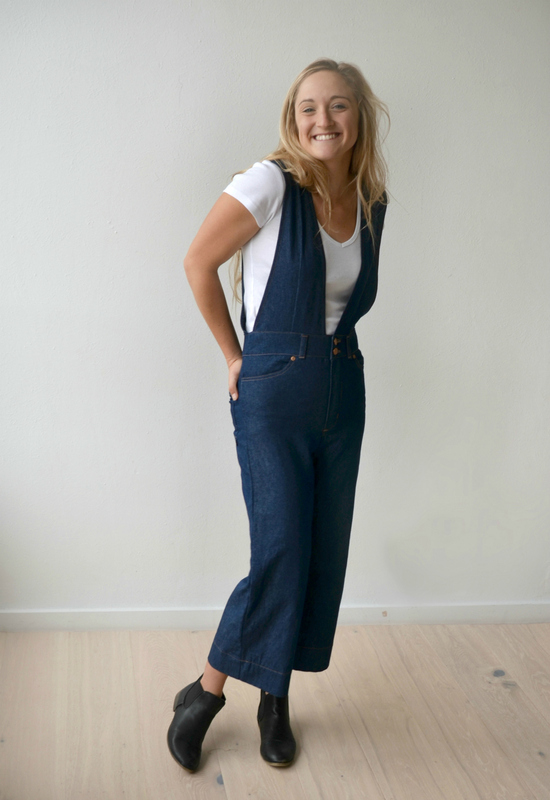 Here’s the answer to the question I know will be asked frequently – Yes, the Kendrick overalls can be made without the straps! 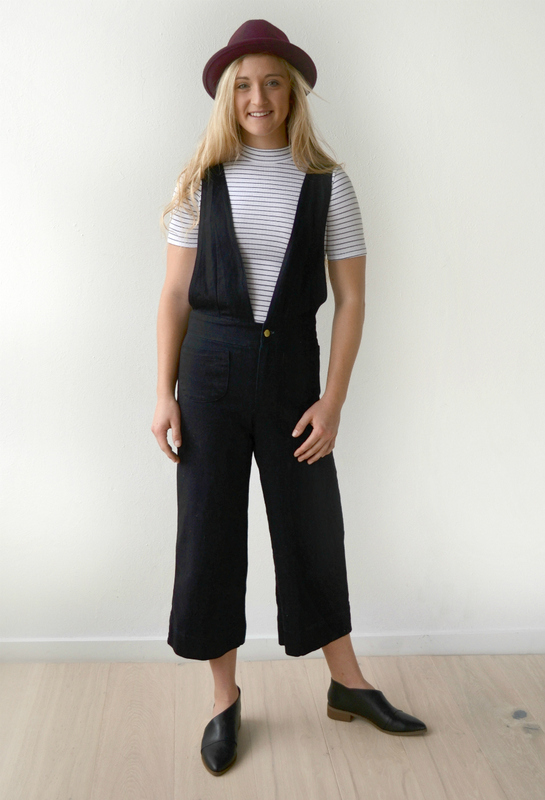 The construction of the pants and skirt with the zip fly and waistband are fully independent of the straps and will work perfectly on their own. This is truly a 4-in-1 pattern! Leaving the straps off is as easy as simply not making them, there are no alterations required. Be sure to grab your copy of the Kendricks while they’re on sale throughout release weekend! Please leave a comment, email, or post in our FB group if you have any questions! Happy Kendrick sewing! Now please enjoy a ton of pictures because I can’t help myself! So young and fresh! Totally adorable!